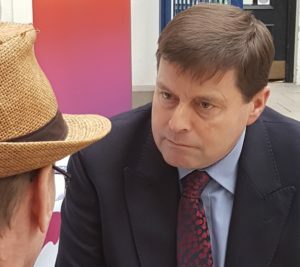 Cumbria’s Police and Crime Commissioner, Peter McCall is visiting West Lakes College on 18th April from 11am – 1pm for a surgery specifically to find out and listen to young students views and ideas about policing and crime in their local area. In addition, he holds monthly public surgeries as opportunities for members of the public to ‘Ask The Commissioner’ questions face to face and these events take place throughout the year around the county. Mr McCall comments: “The aim of my visit to The Lakes College is to listen to and take into account in any decision making, the ideas and concerns of young people. “It is important that young people should have opportunities to express their opinions about policing matters, crime in their local area and talk about how anti-social behaviour in their community has impacted upon them and their family’s lives. “It is a chance for young people to explain, discuss and highlight issues that are important to them and also to explore ways that they can help avoid crime and make a positive contribution to keeping our communities safe. Stuart Williams, Curriculum Operations Lead for Sport and Public Services comments: “We’re really excited to welcome Cumbria’s Police and Crime Commissioner to the college to meet our students and ensure their voices are heard, especially our Public Services students, many of whom are working towards a career in the police force.